And of course, most of all, spread a love your own way! 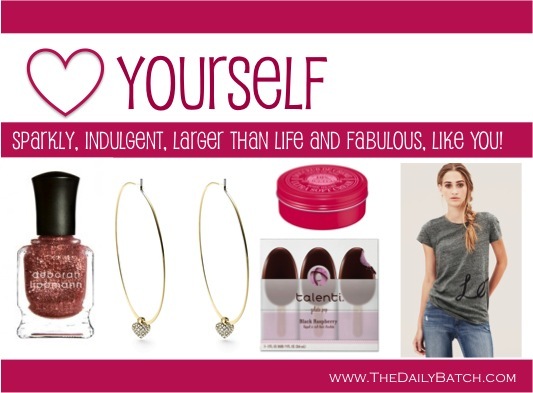 You have to love yourself most of all, so why not treat yourself to a sweet Valentine’s Day gift. It won’t be a surprise, but it should absolutely be special. Pick things out for yourself that no crush or long time love would choose – in other words, be frivolous and fancy free. If you’re buying indulgent sweets, make them the most indulgent, if it’s jewelry you’re after make it sparkly and sublime. V-day gifts for yourself aren’t about man-bashing, or celebrating single-dom; they’re about celebration Y-O-U! Recap all of the gift ideas from this week! This entry was posted in gifts, Her Home, Holidays and tagged v-day gifts, valentine's day gifts, valentine's day gifts for friends. Bookmark the permalink.